The world of competition barbecue is a world where pitmasters and backyard grillers come together for a couple of days to cook six succulent servings of chicken, ribs, pork and brisket slow and low for a panel of certified judges in an effort to make the best BBQ. The judges taste pounds of glorious meat and ultimately decide who is walking home as a grand champion. But what are they looking for? What does it take to make the best BBQ? Christie Vanover from Girls Can Grill became a Kansas City Barbeque Society certified judge to find out. She shares her tips below. Bottom line – it’s all about the meat - its appearance, its taste and its tenderness. Every KCBS judge’s table includes six certified judges. Individual Styrofoam boxes with each competitor’s entry are passed around the table. Judges have a few seconds to rank the appearance of the meat on a scale from 2 for inedible to 9 for excellent. If you break a rule, they will give you a penalty score of 1. KCBS rules can change annually, so it's wise to see if there have been any updates before you compete. Some competitors will display their meat on leafy greens. While this is not mandatory, the contrast of the green leaves against the often-amber BBQ makes the meat pop. It also helps the meat stay steady in the box, so it’s not all jumbled around when the table captain first opens the lid. The greens are not a requirement, so judges can’t score lower, if you leave those out, but they can score lower or even give a penalty appearance score, if you use red-leaf lettuce or other random objects. And don’t even think about shaping your pulled pork into the shape of a pig. Sculpting meat is an automatic DQ. Make the best BBQ turn-in you can by building a box that looks like something you would enjoy eating while following the rules, and you should score pretty well. Violating any of these rules will result in a penalty score of 1. Make sure you turn in the right meat. Only use leafy greens. Red-leaf lettuce, lettuce cores, kale stems and other objects are a no-no. Ensure there are six equal portions – one for every judge. Only sauce the meat. A pool of sauce is a penalty. Never try to mark your container box. Judging is blind. Although these aren’t requirements, here are some pointers that could help increase your appearance score. Cut even portions, so judges get equal opportunities to taste your food. Brush your meat with glaze or sauce to elevate the appearance of moisture. You can’t be docked if your meat doesn’t have a smoke ring, but come on, we all like smoke rings. Next, the meat is judged on taste and tenderness. While tenderness (or lack there of) can impact taste, judges are instructed not to dock you twice for the same flaw. If your meat is tough, but has great seasoning, you can still score high in taste, but low in tenderness. Taste is also judged from 2-9, but this is the score that matters most because it’s weighted the most. There are not specific requirements in this category, other than you need to make one hell of a tasty bite of meat to get a high score. That comes down to understanding BBQ flavor and techniques and lots of practice. Here are some pointers that may help increase your taste score. Play around with different woods. Many pitmaster grand champions cook on the Weber Smokey Mountain Cooker because it maintains the heat well while keeping meat moist. Rubs and sauces provide signature flavor. You’re welcome to make your own, but if you’re starting out, it might be best to try a few pre-made rubs. Weber has a collection of seasonings for every type of competition meat. Consider your region. Judges in Kansas City may prefer sweeter BBQ; while judges in the Carolinas might prefer sour notes. You probably don't want to enter three flat slices of brisket and three burnt ends as your six servings. While judges shouldn’t score you lower for that, the judges who don’t get burnt ends might feel slighted. Whatever you smoke likely has a nice, flavorful bark. Be sure to include bites with bark, if the underlying meat turned out nicely. Sprinkle your meat with a little extra finishing rub to please the judges’ sweet and salty palates. 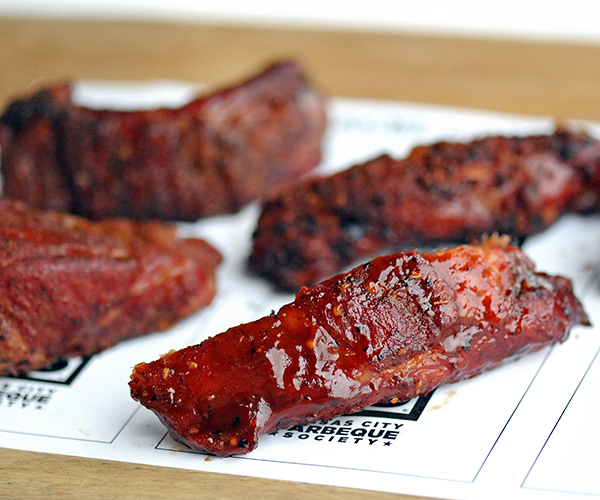 Big time barbecuers include three versions of pork in their boxes: money muscle, pulled and chopped. Do not feel obligated to include all of this, unless every bite rocks. Your taste score will be an average of every bite. Don’t let something that is so-so pull you down. Remember, judges may choose to only take one bite, so every piece of the meat is important. The final score is for tenderness. Tenderness really equals texture. If you’re smoking chicken thighs, it’s best not to serve the judges a slimy, fatty piece of skin. Some competitors go to great lengths to avoid this. They remove the skin, scrape off the excess inner fat and then replace the skin over the meat. Their goal is to create a nice snap of texture when judges take their first bite. For brisket, judges often conduct the pull test. They grab a slice of brisket by each end and pull it apart. If it falls apart before even pulling, it’s too tender. If it takes too much effort to pull it apart, it’s too tough. 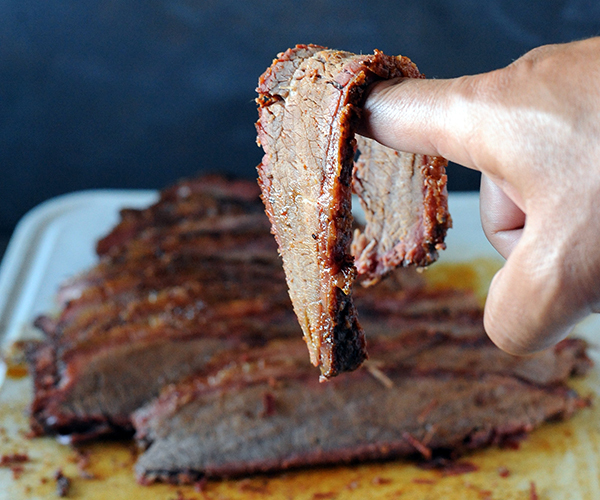 You can also drape the brisket slice over your finger. If it bends nicely without breaking (AKA #LimpBrisket), you’re probably close to a top score. Ribs – believe it or not – should not fall off the bone. If all of the meat slides off with the first bite, they’re too tender. Judges are looking for a bit of bite to the meat. There are no set requirements in this category. Judges will score a 2 for inedible, up to a 9 for excellent. This is where you will get dinged if your meat is under or overcooked. Here are some pointers that could help increase your tenderness score. For brisket, you are not required to include servings from the flat and point. You just have to include six servings of meat. If your flat turns out dry, turn in burnt ends. In the chicken category, you are welcome to grill any part of the chicken, but thighs are often the common turn-in because they are usually juicier than breasts. Watch out for fat. 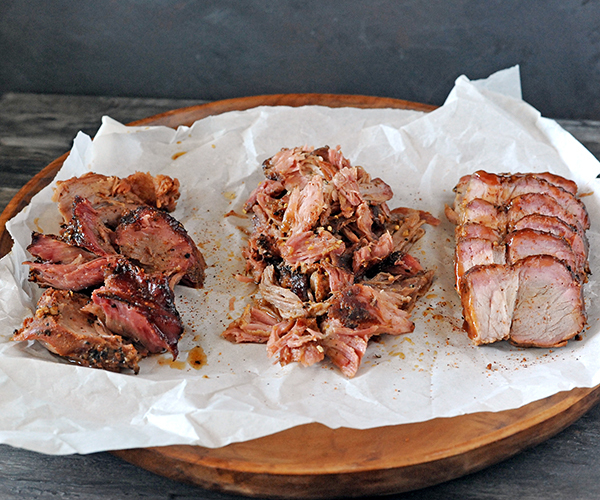 While fat is flavor, you don’t want to give judges a big bite of chewy pork fat with their chopped or pulled pork. Remove the silver skin from your ribs before smoking. It will help them pull from the bone more gently. If you decide to wrap your meat, wrap it nice and tightly so it doesn’t steam and create soggy bark. If you really want a leg up on the competition, become a judge yourself. Then, you'll have the opportunity to see what other turn-in boxes look and taste like and why they score the way they do. It's a great way to elevate your scores from a 6 or 7 to a 9. Best of luck. Here's hoping a GC is in your future. Follow Girls Can Grill on Facebook, Instagram and Twitter!